Heat oven to 350°F. Spray 9-inch tart pan with 1-inch rim and removable bottom with cooking spray. In large bowl, beat 3/4 cup softened butter and 1/4 cup sugar with spoon until well mixed. Stir in flour until blended (dough will be crumbly but can be pressed together). Pat and press dough very firmly on bottom and up sides of tart pan. Bake 14 to 18 minutes or until crust is set in center but still pale. Cool 15 minutes. In 2-quart saucepan, mix 1 cup sugar and the cornstarch. Gradually stir in water, lemon zest and lemon juice until smooth. Cook and stir over medium-high heat. Heat to boiling; boil 1 minute, stirring constantly, until mixture is bubbly and thickened. Remove from heat. In small bowl, beat egg yolks with whisk. Gradually beat about 1/2 cup hot mixture into egg yolks. Gradually stir yolk mixture into hot mixture in saucepan. Cook over medium heat, stirring constantly, until mixture starts to gently boil. Cook 2 minutes longer, stirring constantly. Remove from heat; stir in 2 tablespoons butter. Pour over cooled baked crust. Cool at room temperature 15 minutes; refrigerate at least 3 hours until set. 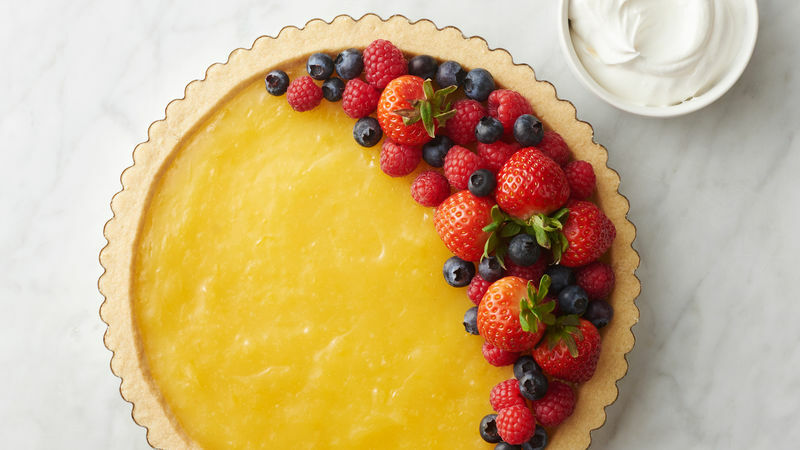 When ready to serve, sprinkle fresh berries on top. Serve with whipped cream. Store loosely covered in refrigerator. To make 1 1/2 cups whipped cream, place medium deep bowl and beaters in freezer or refrigerator to chill. Place 3/4 cup heavy whipping cream and 1 tablespoon powdered sugar in bowl. Beat on low speed until mixture begins to thicken. Add 1/2 teaspoon vanilla, then beat on high speed until whipped cream forms soft peaks. To serve slices, cut with sharp knife, cleaning knife blade after each cut. 1 medium lemon yields about 3 tablespoons juice and 2 to 3 teaspoons grated lemon zest.